In celebration of the 20th anniversary of the Wolfenstein 3D video game, id Software has launched the game for free in the App Store! The game includes all six of the original episodes and 60 levels. The company has also launched a browser version of the game for free. 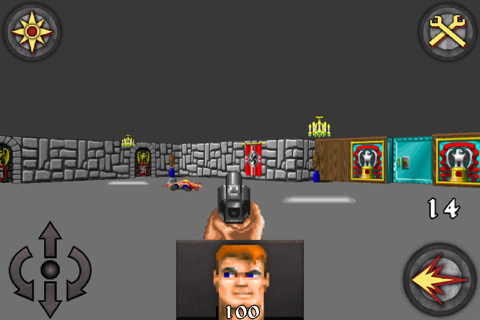 Wolfenstein 3D is one the first FPS games that I played and without a doubt defined the FPS genre. The game play and weapons have inspired countless games in the last 20 years and Wolfenstein continues to be an engaging game to play! For those that may be learning about Wolfenstein 3D for the first time, the game centers around a captured US spy (you) and his attempts to escape a WWII prison called “Castle Wolfenstein”. Play the legendary original game that launched the First Person Shooter genre. You are OSA super agent B.J. Blazkowicz and you must escape from Castle Wolfenstein and defeat the twisted Nazi regime! Includes all six original episodes with 60 classic levels and unforgettable weapons, like the brutal chain gun, that still define action gaming today. For a limited time the game can be downloaded in the App Store for free.